Above: Santa Fe in New Mexico. Surprising New Mexico. 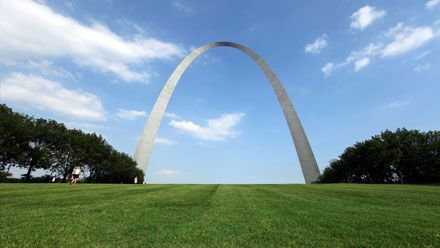 Land of extremes and contrasts, capped by high mountains and home to extensive desert plateaus, small towns and large megacities, blending of Indian, Spanish and Mexican traditions, a territory of savory specialties and craft that Route 66 covers end-to-end over 400 miles. The considerably high mountain ranges forced Route 66 engineers to perform civil engineering feats. For travelers of the early twentieth century, some mountain passes in New Mexico became legendary and feared by motorists, who often found themselves stranded, abandoned by the stuttering engine of their cars - not as tough as the travelers themselves! 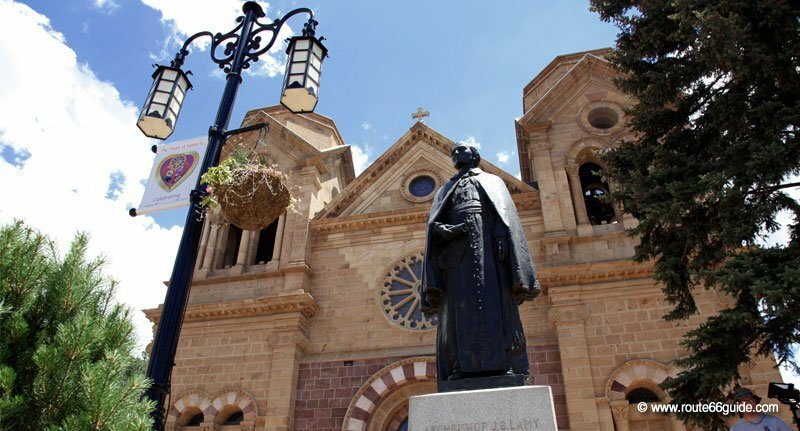 Above: The Basilica of St. Francis of Assisi in Santa Fe, the oldest city in the West, and home to one of the most enchanting downtowns along Route 66. It is definitely worth it to take a long detour in the high mountains beyond 7,000 ft. above sea level just to drive on one of the oldest alignments of Route 66. Still today, cautious motorists - whether driving 4x4 vehicles or not - renounce to follow certain Route 66 sections, especially under heavy rains (e.g., from Texas, entering New Mexico through Glenrio, it is highly advisable to back up and head over to Interstate I-40). Historic land, colonized by the Spanish from the seventeenth century, it contains many ruins of previous civilizations. 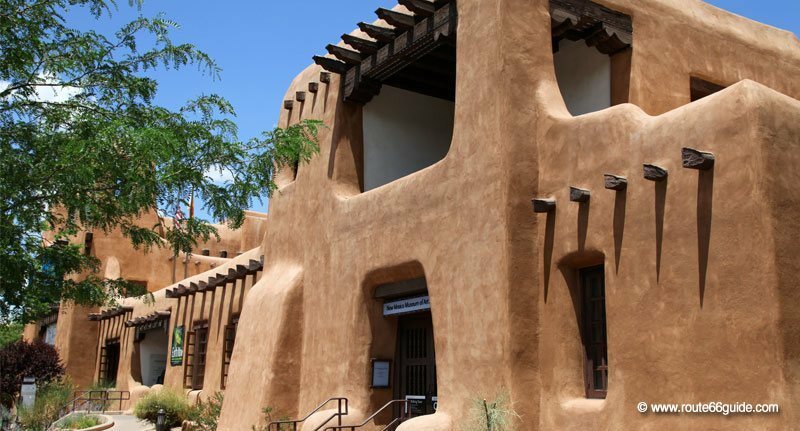 New Mexico combines their records and hosts many of the oldest buildings on the continent and / or country, especially in Santa Fe, the state capital, perched off the Interstate at over 7,000 ft. elevation. 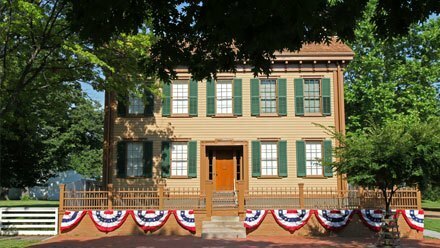 It is the oldest city in the West, which houses the oldest house (about 1200) and oldest church (1625) in the country, among other notable buildings classified as historic sites. 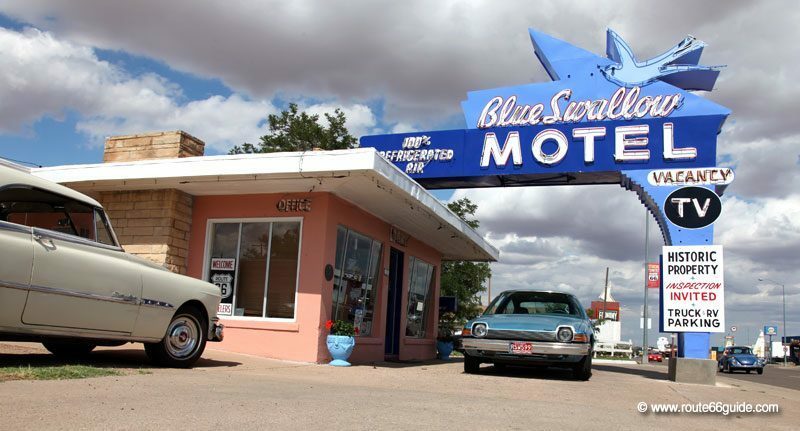 Above: The Blue Swallow Motel in Tucumcari, New Mexico. 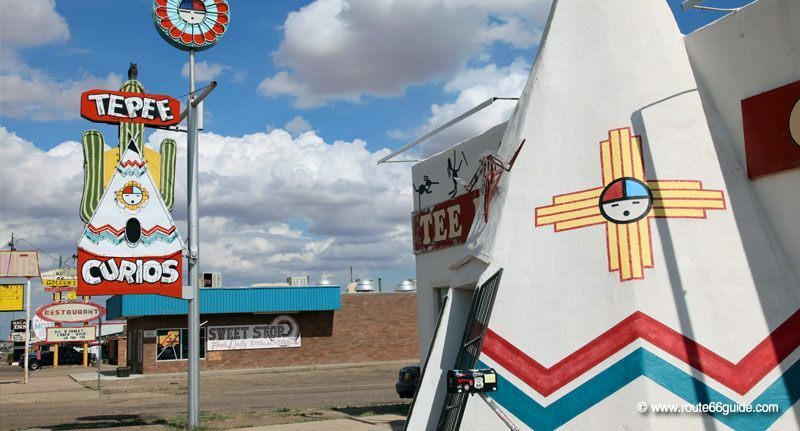 Above: The Tee Pee Curios in Tucumcari, New Mexico. The Blue Hole of Santa Rosa is a geological phenomenon of rare beauty, a cavity 80 ft. deep holding a fresh and clear water lake (64 ° F continuously). Scuba is allowed. Several other bodies of water and rivers lend themselves to swimming around the stunning Santa Rosa, nicknamed "City of Natural Lakes", like an oasis in the heart of these arid landscapes. Above: Route 66 Restaurant in Santa Rosa, New Mexico. 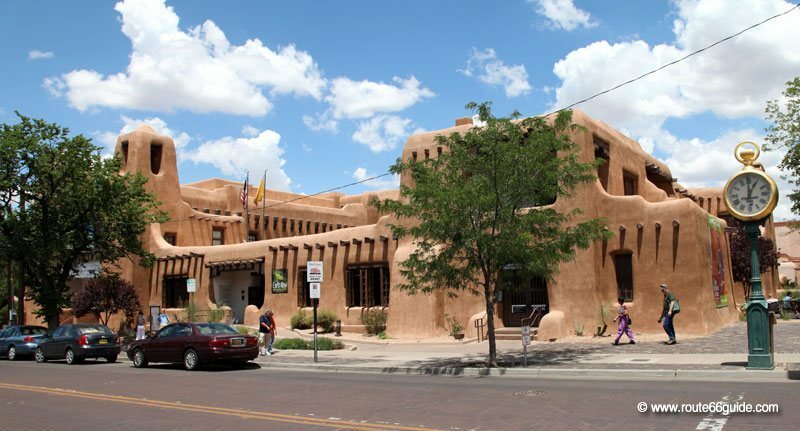 The Santa Fe Plaza, the main square of the capital of New Mexico, which arranges itself around the Palace of the Governors and is flanked by ravishing, small adobe buildings in the Spanish pueblo style. Every day at 8 am there is a market for Indian handicrafts. In the historic center of Santa Fe, all buildings are protected and no new constructions are allowed from the last century. Above: The historic downtown of Santa Fe, protected since the last century, is exclusively made up of small adobe buildings like the one depicted. This is one of the most charming cities along Route 66, absolutely worth a visit at the end of an - admittedly long - detour through the mountains, following the oldest alignment of Route 66 dating back to 1926, which was abandoned in 1937 - the vehicles of the time could barely handle it. 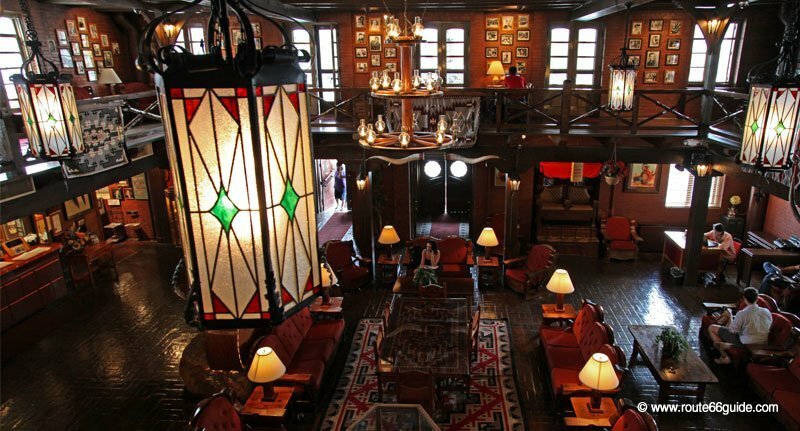 La Fonda Hotel in downtown Santa Fe is one of the oldest hotels in the United States. Indeed, this "fonda" (or hostel) was built in the seventeenth century. Nowadays, it hosts a luxury hotel enveloping its guests in a sophisticated, historic and authentic atmosphere, well protected by its adobe walls. 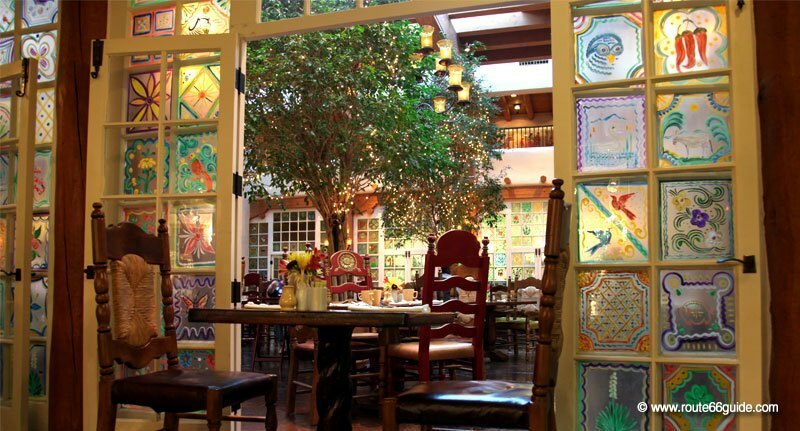 Restaurant La Plazuela is a highly advisable option as well. Clines Corners Retail Center claims to be the largest gift shop in New Mexico. 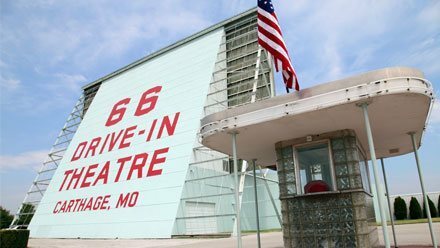 It is nestled in an old gas station from 1934 and has managed the feat of moving three times to remain on the edge of the successive Route 66 alignments. Above: Clines Corners Gift Shop in New Mexico. The Wild West Nature Park in Edgewood is maintained by the "New Mexico Wildlife Association" and presents coyotes, cougars and other species of the surrounding areas. 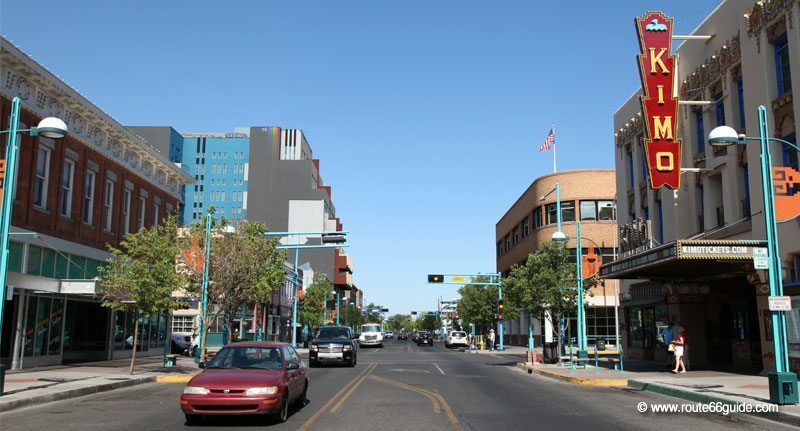 Central Avenue in Albuquerque is the longest avenue in the world. It runs for 18 miles (about 30 kilometers) or 3,200 blocks. Route 66 follows it across the city from east to west, in a grim succession of abandoned motels and announcing billboards. In the 1950s, over a hundred motels crowded along the edges of Route 66. 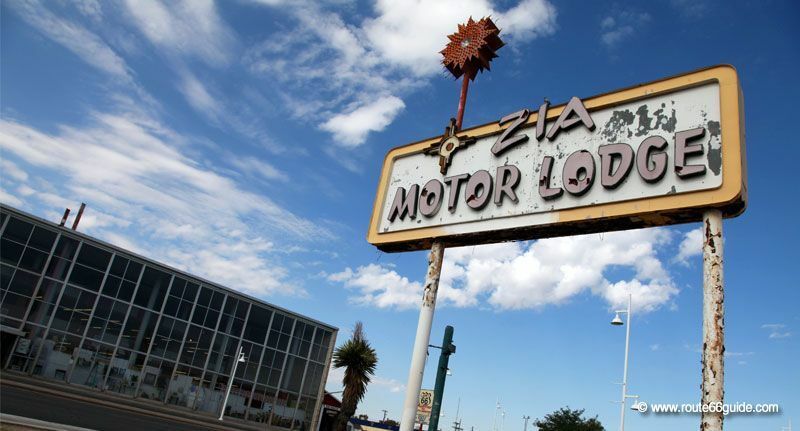 Above: Zia Motor Lodge sign on Route 66 in Albuquerque, New Mexico. 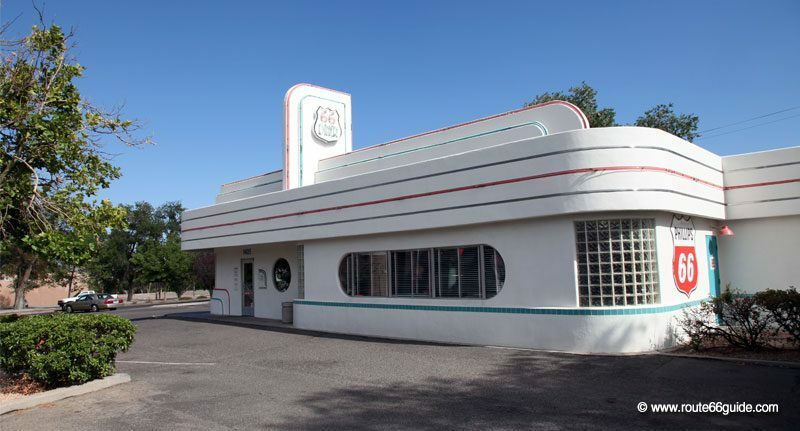 The 66 Diner of Albuquerque is probably the most beautiful building in "streamline-style", typical of the 1940s along Route 66. 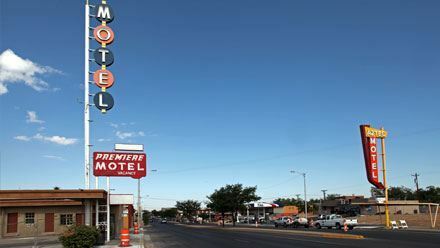 It hosts the headquarters of the Route 66 Association in New Mexico. 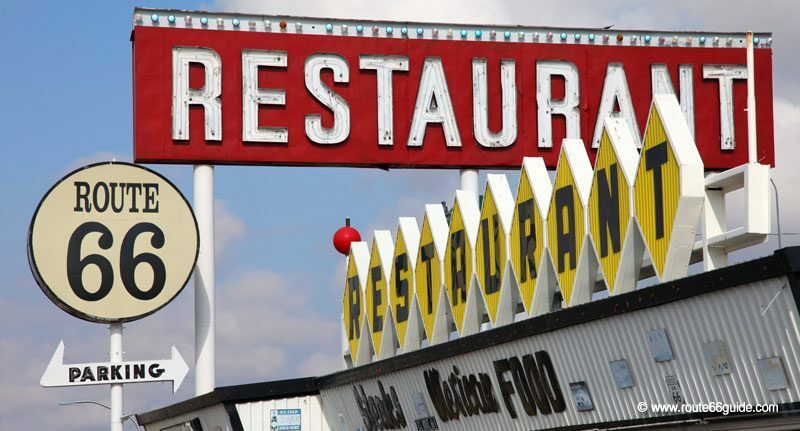 Above: The 66 Diner in Albuquerque, one of the most beautiful family-diners along the historic route. The KiMo Theatre overlooks the beautiful downtown Albuquerque, flanked by numerous terraces. 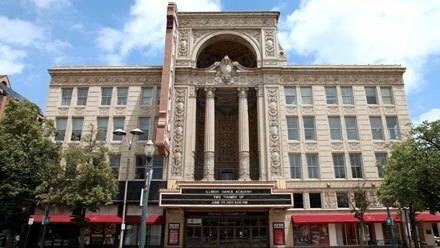 Built in 1927, the theater presents a completely unique architectural style, at the intersection of Indian influences and art-deco, called "Pueblo Deco". Above: The KiMo Theatre in Albuquerque, New Mexico. Grants Cafe in Grants shows off its lovely panel near Route 66. It serves "yellow cakes", whose deep yellow color resembles that of the uranium, largely responsible for the region's prosperity. 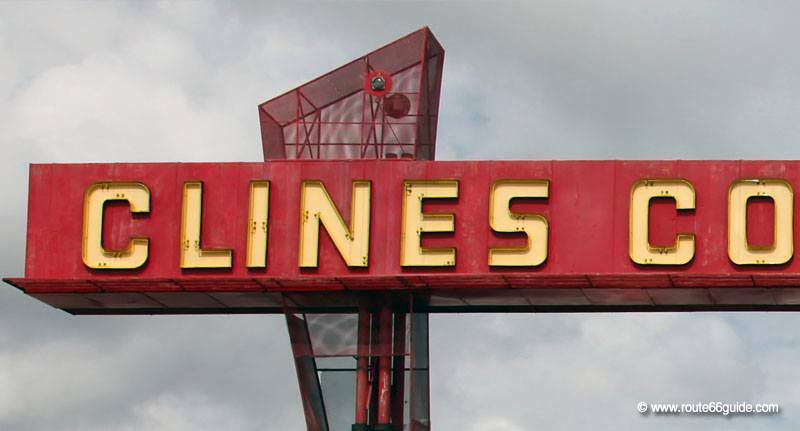 Above: The retro sign of Grants Cafe, red and blue, is a symbol of Route 66 in New Mexico. 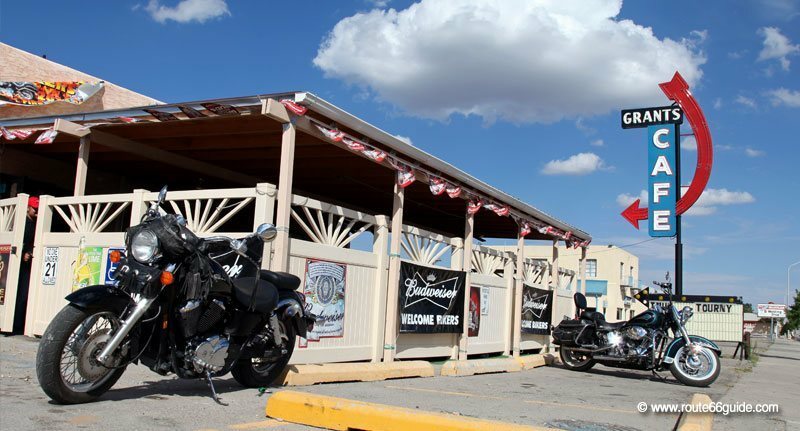 El Rancho Hotel & Motel in Gallup was one of the best lodging establishments in New Mexico. This is evidenced by the many autographed portraits of the biggest film stars, most of them regulars in the golden era, when New Mexico was readily considered the branch of Hollywood studios. They ornate the opulent hall, nestled in the shelter of a tall, woody structure crafted in the delightful spirit of a "mountain chalet". Above: El Rancho Hotel & Motel in Gallup, New Mexico. 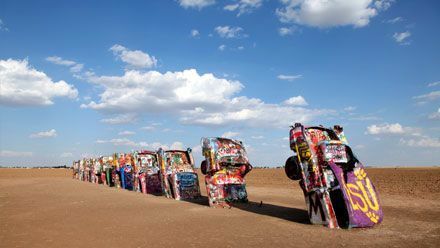 In New Mexico, Route 66 may prove particularly challenging for standard vehicles (without a full-wheel drive option - 4x4), especially after heavy rains. At times, it would be better to back up and leave the historical route behind, taking the safer Interstate instead. Above: Albuquerque in New Mexico. 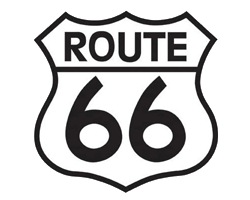 In 1926, the original Route 66 passed through the capital of New Mexico, Santa Fe, at 7,200 ft. above sea level. This section, however, was abandoned in 1937 in favor of a more direct connection between Santa Rosa and Albuquerque. New Mexico is the fifth largest state in the country. Its feet treading the valley of the legendary Rio Grande (1,900 miles long), which divides the state from north to south, and its head up in the Sangre de Cristo mountain range. Its highest point, Wheeler Peak, sits slightly below 13,000 ft. altitude. 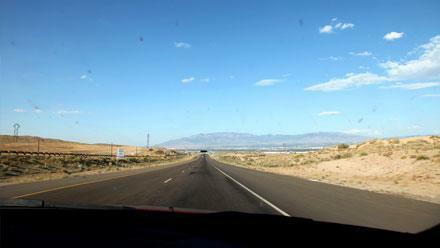 Above: Route 66 in New Mexico, between Grants and Albuquerque. Here, perennial snow clings to the highest mountains cliffs. At times, cable cars traverse them, taking ski enthusiasts to the starting point of impressive ski areas such as those in the heights of Albuquerque. Ski resorts in the desert highlands: talk about a stunning postcard!